The Apollo Theatre was the first West End theatre of the Edwardian period built in 1902. 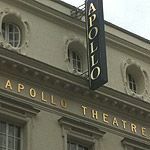 Do you work at Apollo Theatre? What did you think of Apollo Theatre? Excellent venue. Went to see Glengarry Glen Ross here and it was simply brilliant. Yeah, I've heard really good things about it, and him of course! Hopefully going to see it in a couple of weeks, just gotta get a group of girls together so we can go and ogle him - though I'm sure the play itself is good of course! God I can't wait to see Josh Hartnett in Rain Man, swoon, what a dreamboat! I saw this show in 19 December. Matinee performance. It's a good show. Clearly Mark Rylance stands above the rest of the cast in every way. But it is the essence of what this production does by bringing Shakespeare as it probably was back to life. the set is simple yet intricate. Costume absolutely brilliant. The musicians and instruments you would never had seen live before in such a way.It's long, has its dull moments but overall a great performance. beleive me you wont be disappointed, the play is funny to, im going to try and get tickets to go and see it again in nov, will prob have to go on my own though this time as i dont think my partner would go again plus i want to try and get his autograph after the show lol! Saw Rain Man during preview week so I'm bearing in mind the running may now be as smooth as usual. Performance started 15mins late which is unusual for a West End show. Was seated in balcony with great view but dialogue at times very hard to hear and decifer. Adam Godley's portrayal of Raymond was sincere and touching with a good touch of humour. Hartnett was in all honestly disappointing, unclear delivery, several fluffed lines and no real presence on stage which I was hoping for- Godley certainly deserves greater credit. Also some expletive-filled outburts from Hartnett's character that didn't feel fully warrented. Other cast members are quite forgettable. The pacing is strained at times and slow throughout, leaving a wish for urgency and pace at times...felt like a car grinding to a half on a few occasions. Interval was about 25mins long and second half only 30mins long with one of the most abrupt endings I've ever seen on stage. The plot stays close to the original film but those hoping for award-winning performances will be left disappointed.